It’s always fun starting projects that have a festive theme because they always make excellent decorations as well as gifts! 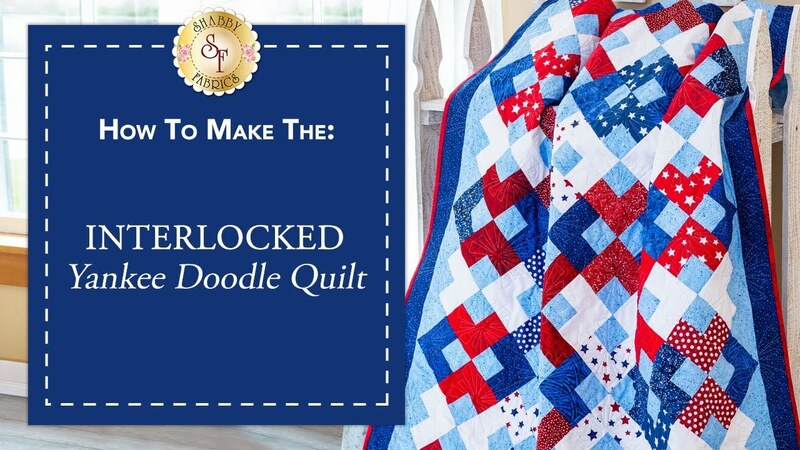 The tutorial we have today is the Interlocked Yankee Doodle Quilt! The tutorial is hosted by Jen and Tammy from Shabby Fabrics, but the project itself originates from Wilmington. The quilt that they put on display shows a complex looking looking pattern in all red, white, and blue. As we quilters have come to know, the display may look complex, but the process is actually not that hard at all, especially with the great aid that Tammy and Jen bring to the table. The great thing about this project is that it really can be done with any fabric so feel free to get creative if the theme is not for you. Otherwise, the fabric that they use can be conveniently found in the description box below the video. The pattern itself is by Wilmington Prints who have done some great work, as we all may know. Quilting may not be necessary for hot weather, but the great thing is that quilts can easily be cute to throw on the back of the couch for festivity reasons. Don’t forget to check out the video below, it’s fun to watch and really helpful. Have fun quilting the Interlocked Yankee Doodle quilt! To see their available fabric, click here.